Ricky Alexander played clarinet, tenor and soprano sax with the band in 2009-12 while a student at the U. of Maryland. Ricky also played in the Tom Cunningham Jazz Orchestra and led his own jazz groups. He was named to the All-County (twice) and All-State Jazz Ensembles and was a Maryland Distinguished Scholar of the Arts. He went on to pursue graduate studies in music at New York U. In New York City Ricky leads his own trad jazz group, the Early Bird Jazz Band, in addition to performing with Glenn Crytzer's Savoy Seven and Big Band, the Brooklyn Sugar Stompers, the New Wonders, and the Hot Jazz Jumpers. Brian Almeter played cornet and trumpet with the band in 1997-98. Brian studied at Indiana University. He worked for the Smithsonian Jazz Masterworks Orchestra, transferring handwritten arrangements to computer notation, and was also Assistant Jazz Band Director at Fairfax HS. Kate Amrine played trumpet with the band in 2009-10 while a student at Walt Whitman HS. Kate also played in the Jazz Academy Orchestra and the Blues Alley Youth Orchestra, and was a semifinalist in the National Trumpet Competition. Kate was selected for the All-County and All-State Jazz Ensembles, and was accepted into the Eastman Summer Classical, Jazz, and Trumpet Institute programs. She went on to graduate from New York U., and now plays in the Hot Shim Sham Orchestra, Swingadelic, the Ross Kratter Big Band and other jazz and classical ensembles and musicals in New York City. Kate also teaches, and works as tour manager for jazz trumpet star Jeremy Pelt. Mark Armon played tuba with the band in 1996-97 while a student at Centreville HS. He went on to work in film production in New York City. Keith Atteberry played banjo and guitar with the band in 1991. Keith studied Music Education at Pembroke State U.
Russell Baker played trumpet with the band in 1997-98 while a student at Bethesda-Chevy Chase HS. Russell was selected for the Maryland All-State Jazz Band, and was the 1998 winner of the national Bix Lives Jazz Award. Russell went on to attend Columbia U.
Joel Baroody played drums with the band in 2003-2004 while a student at Herndon High School. He went on to major in music at the U. of South Carolina, with plans to play professionally. Tom Barrick played drums with the band in 1992. Tom later played with Doc Scantlin and his Imperial Palms Orchestra, the Greg Harrison Jazz Band, the Boilermakers Jazz Band, Dave Sager's Pie in the Sky Jazz Band, and Dave Robinson's Conservatory Classic Jazz Band. He currently holds the drums chair in the Radio King Orchestra and the jazz/pop group Chaise Lounge. Ben Bayer played tuba with the band in 1997-98 while a student at Wheaton HS. He went on to study Music Education at West Virginia U.
Pete Begina played tuba with the band in 2012-14 while a student at the U. of Maryland. Pete graduated with a degree in music. In high school he was consistently named to the All State Bands and Orchestras. He also played in The Tuesday Brass, and toured nationally with The King's Brass. Pete now manages a music store in Washington state. Teedo Bilecky played banjo and guitar with the band in 1989-90 while a student at JEB Stuart HS. Alan Biller played banjo, guitar and clarinet with the band in 1997-99 while a student at Richard Montgomery HS, and rejoined for 2007-8. While in high school, he was named to the All-State Jazz Ensemble. Alan went on to major in jazz performance at New York U., where he formed a student traditional jazz group, the Washington Square Stompers. He later played bass on cruise ships, and served as a jazz intern at the Smithsonian. Alan returned to New York to pursue graduate studies at New York U.
David Brenneman played trombone and tuba with the band in 2008-16 while a student at the U. of Maryland. David was awarded the John Phillip Sousa Award and the Patrick S. Gilmore Award, and was named to All-State Band three years, including one year as first chair. He has performed with the Baltimore Symphony, the Capital Wind Symphony, Dixieland Express, and the Swing Time Big Band. Nick Brewer played piano with the band in 1996 while a student at Frederick Douglass HS. He won several awards for outstanding musicianship before moving to Germany. Wil Brumbach played banjo and guitar with the band in 2008-12 while a student at the U. of Maryland. Wil studied with jazz guitarist Pat Martino. He is a recipient of the Louis Armstrong Jazz Award as well as various soloist awards. Wil has played with the New Orleans-style brass band Yamomanem, and has been active as a studio musician. He went on to teach instrumental music in Maryland public schools, and now teaches at the U. of Southern California. Antonio Castro-Ossorio played piano with the band in 2007-8 while a student at Quince Orchard High School. Antonio was named to the All-State Jazz Ensemble twice, and received a "Top Talent Circle" rating from the National Guild of Piano Teachers. Antonio went on to study jazz at the U. of North Carolina--Greensboro before moving to New York City. He has toured China twice, was a finalist in the Nottingham International Jazz Piano Competition, and was awarded Best Band at the Bucharest International Jazz Competition. He is also the recipient of a DownBeat Award for Best Jazz Arrangement. Antonio has arranged and recorded with Lee Konitz, Donny McCaslin, Delfeayo Marsalis, and Marcus Printup, and he composes for film and multimedia. Eric Chandler played trumpet with the band in 2009 while a student at Walter Johnson HS. Eric also played in the Blues Alley Youth Orchestra. He went on to attend Carnegie Mellon U.
Elijah Cole played piano, guitar and banjo with the band in 2013-16 while a student at Walter Johnson HS. He was a recipient of the Arts Star Award, and was a Young Artist Merit Winner. Elijah also played in the Blues Alley Youth Orchestra and the Jazz Academy Orchestra, and led his own jazz trio. He was named to the All-State Jazz Ensemble twice, as well as the Music for All Jazz Band of America. Elijah attended the Eastern U.S. Music Camp, and also plays bass. He now attends Temple U.
Perry Cowdery played banjo and guitar with the band in 2011-12 while a student at Westfield HS. He was named to the All-State Jazz Ensemble, and received an Outstanding Soloist Award at the FiestaVal Competition. Perry also received the Chantilly Jazz Festival's Summer Jazz Workshop Award, as well as the Glenn McCarthy Award as the top senior guitarist in his school. He now attends Columbia College in Chicago. Seth Crail played clarinet and tenor sax with the band in 2014-15 while a student at Oakton HS, and rejoined for summer '17 while a student at U. of Miami. He was selected as first chair for the All-State Jazz Ensemble and the All-District Wind Ensemble, and also won soloist awards, including the Essentially Ellington Outstanding Soloist Award. Seth also played in the Blues Alley Youth Orchestra. He is now majoring in music at U. of Miami's Frost School of Music, where one of the ensembles in which he plays won a DownBeat Award. Mike Curtis played drums with the band in 1991 while a student at Seneca Valley HS. He is now a jazz drummer and studio technician in California. Jeanie Dawson played clarinet with the band in 1989-90 while a student at Catholic U. Jeanie became a music teacher at Maret School. Sam Dingman played clarinet and soprano sax with the band in 1999-2000 while a student at T.C. Williams HS. Sam was a winner of the Woody Herman Jazz Award and Chantilly Jazz Festival's Best Soloist Award, and was named to the All-State Jazz Ensemble. He went on to attend Swarthmore College. Reuben Dubester played drums with the band in 2015 while a student at Woodrow Wilson HS. Reuben was a recipient of the Essentially Ellington Outstanding Player Award, and held the top drum spot at the Interlochen jazz program. He was selected to study with top artists at the Dave Brubeck Summer Jazz Colony. He also played in the Blues Alley Youth Orchestra and the Minor Third Trio. Anders Eliasson played drums with the band in 2009-2012 while a student at the U. of Maryland. Anders is a recipient of the Louis Armstrong Jazz Award. He is currently the drummer in Dave Robinson's Conservatory Classic Jazz Band. He has performed with the SingCo Rhythm Orchestra, Dixieland Express, Hot Society Orchestra of Washington, Jim Ritter's Creole Gumbo Jazz Band, and the New Orleans-style brass band Yamomanem, and also plays in the James Bazen Big Band and Don Junker Big Band, in addition to leading his own jazz combos. Matt Ellison played banjo and guitar with the band in 1993-95. Matt studied at Berklee School of Music. Greg Englar played banjo and guitar with the band in 2006 while a student at James Hubert Blake HS. He was named to the All-State Jazz Ensemble, and played in the Blake Dixieland Band. Greg went on to attend New York U.
Dave Erickson played trumpet with the band in 1993-94. He has played in the HOTS Jazz Orchestra, Doc Scantlin and his Imperial Palms Orchestra, Laissez Foure (trad jazz), Blue Crescent Syncopators, the New Columbia Swing Orchestra, and Dave Robinson's Conservatory Classic Jazz Band, and led a group called D.C. Dixie. Dave is married to CFJB alumna Rachel McCarthy. Arianna Fanning played drums with the band in 2007-8 while a student at Langley HS. A recipient of the Louis Armstrong Jazz Award and Premier Young Artist Award, she is also the winner of national scholarships awarded by the Percussive Arts Society and by Modern Drummer Magazine, and was selected for the prestigious Governor's School summer program as well as the All-State Jazz Ensemble. Arianna has also played with the Blues Alley Youth Orchestra and the Annandale Jazz Ambassadors, with whom she performed overseas. She has served as a counselor at the National Jazz Workshop. Arianna went on to the jazz studies program at Indiana U., and is now gigging in Nashville. Brian Farrow played banjo and guitar with the band in 2009-10 while a student at Clarksburg HS and then Howard U. Brian also plays bass. Harlan Feinstein played trumpet, trombone, clarinet, and tuba with the band from 1989-94 while a student at Georgetown U. Harlan became a member of the board of directors of the Potomac River Jazz Club. He now works as a computer programmer and musician in the Seattle area. Keith Fitzgerald played trombone with the band in 1998 while a student at George Mason U. He was selected to be in one of the bands at Disney World in Florida. Keith went on to join the Air Force Band at Wright-Patterson Air Force Base in Ohio. Drew Flores played piano with the band in 2009-18 while a student at George Mason U. He is a recipient of the Louis Armstrong Jazz Award, and majored in jazz studies. He currently composes and leads his own jazz group in addition to performing with the Thad Wilson Jazz Orchestra, the Twins Jazz Orchestra, and Joe Brotherton Quintet. Drew has performed for the Vice President, and was named an Artist-in-Residence at Strathmore. TJ Fredrick played tuba with the band in 2001 while a student at Herndon HS. He went on to pursue a Doctorate in Music Composition. Mike Gallant played piano with the band in 1998-99 while a student at Sidwell Friends School. He received Honorable Mention in the ARTS National Talent Competition, and was named to the All-State Jazz Ensemble. Mike continued his studies at Columbia U, and served as Senior Editor for Keyboard Magazine. He now composes and performs for theater productions in New York City. Brian Garland played trumpet with the band in 1989 while a student at JEB Stuart HS. He went on to graduate from James Madison U., and later became the Band Director at Falls Church HS. He is now in Los Angeles composing music for films and television. Cary Gilmore played banjo, guitar and piano with the band in 2013-15 while a student at Westfield HS. He performed at the Tinner Hill Blues Festival and the Mid-Atlantic Guitar Festival, and also played in a jazz group called Guava. Cary has also performed on banjo with Shannon Gunn's hot dance band. Cary went on to attend the Berklee College of Music. Justin Greville played drums with the band in 1989-90 while a student at Sandy Spring Friends School. He went on to study at Berklee School of Music. Ben Grimley played trombone with the band in 1990 while a student at Winston Churchill HS. Hart Guonjian-Pettit played trumpet with the band in 2017 while a student at the U. of Maryland. Hart majored in music education and jazz studies. He was selected for the Mid-Atlantic Collegiate Jazz Orchestra directed by Delfeayo Marsalis. Hart is a student teacher of music in the public school system, and teaches trumpet privately. His performance credits include Walt Disney World, the Skidmore Summer Jazz Institute, and Meyerhoff Symphony Hall. Hart also leads his own jazz quintet and plays in classical ensembles. Lionel Haas played piano with the band from 1992-95 while a student at Georgetown U. He later studied in England before moving back to his native Germany. Calvin Haney played trumpet with the band in 1996 while a student at Northern Virginia Community College. He went on to study at Virginia Commonwealth U. to be a music teacher. Ben Hankle played trumpet with the band in 2005-06 while a student at the U. of Maryland. Ben was in the All-State Jazz Ensemble in New Jersey for four years. He also spent three years in the New York Tri-State Grammy Jazz Band, and one year in the All-American Grammy Jazz Band. Ben now plays jazz gigs in New York City. Brian Harper played clarinet and soprano sax with the band in 1991-92 while a student at Richard Montgomery HS. Jake Harper played piano with the band in 2006 while a student at Winston Churchill HS. He was named twice to the All-County Jazz Ensemble, and participated in the Paul Carr Jazz Camp. Jake also played in the Blues Alley Youth Orchestra and the Early Birds Jazz Collective. He went on to attend New York U.
Steve Helfand played drums with the band in 1999-2000 while a student at Montgomery Blair HS, and rejoined in 2002-03 while a student at the U. of Maryland. He also performed locally with the James Bazen Big Band, the Blue Sky Five, the Celestial Sliphorns and the SingCo Rhythm Orchestra. Steve toured internationally for several months as a member of the Glenn Miller Orchestra, and then joined the Air Force's Heartland of America Bands in Omaha NE, including the jazz big band The Notables. He is now stationed in Japan, playing in an Air Force jazz band and freelancing around Tokyo. Allan Hill played clarinet and alto sax with the band in 1989 while a student at Montgomery Blair HS. Allan went on to graduate from New England Conservatory of Music. Sam Hillmer played clarinet and tenor sax with the band in 1996 while a student at Montgomery Blair HS. Sam went on to study music composition at the Manhattan School of Music. He now gigs around New York and runs an arts program for young people at a community center in Brooklyn. Brett Hunter played drums with the band in 1997-98. Brett studied at Cleveland Institute of Music. He toured Germany with the Washington Symphony Orchestra, and performed with the Federal Jazz Commission, the Sunshine Skiffle Band, the Beall Street Seven, and Doc Scantlin and his Imperial Palms Orchestra. Jon Ilhan played tuba with the band in 1999 while a student at Chantilly HS. He went on to attend Purdue U.
Dave Joyce played tuba with the band in 1989-93 while a student at Georgetown U. He was previously selected for the McDonald's All-American High School Band. Dave became an accountant on Wall Street, and subsequently relocated to Florida. Byung Kang played drums in the band in 2009 while a student at Walter Johnson HS. Byung was selected for All-County Jazz Ensemble. Joe Kaplowitz played tuba and piano with the band in 1989-91 while a student at South Lakes HS. He was later selected for a spot in the band at Walt Disney World. Joe was awarded the David Robinson Scholarship by the International Association of Jazz Educators in 1995. Joe graduated from Youngstown State U., and now works as a jazz organist in New York City. Brian Kaufman played tuba with the band in 2007-8 while a graduate student at the U. of Maryland. 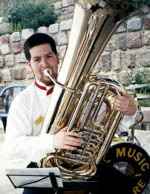 He has a degree in music education and tuba performance from the U. of Michigan, and completed his Masters in tuba performance. Brian has taught at summer music festivals, and went on to pursue post-graduate studies in conducting at New England Conservatory while managing a youth orchestra. He has also done gigs as a jazz singer. Jon Kaufman played clarinet and alto sax with the band in 2010-11 while a student at Walt Whitman High School. He studied jazz at the Interlochen Arts Camp, and was named to the All-State Orchestra and Band and All-County Band and Jazz Ensemble. John also played in the Jazz Academy Orchestra. He went on to attend the U. of Michigan. Brian Keegan played tuba, trombone, trumpet, and clarinet with the band from 1995 to 2003. After graduating from Chantilly HS, Brian studied at Shenandoah Conservatory of Music, Northern Virginia Community College, and George Mason U. Brian was a winner of the Woody Herman Jazz Award, and received a National Communicator Award for his original jazz soundtrack to a documentary film. He toured Germany with the Washington Symphony Orchestra; played in D.C. Dixie, the Celestial Sliphorns, and the SingCo Rhythm Orchestra; toured with the Bud Forrest Big Band; and appeared with the Artie Shaw Orchestra and the Glenn Miller Orchestra. With a Masters in jazz trombone, Brian went on to teach music at the U. of Miami, after which he was accepted into the Army Field Band Jazz Ambassadors. Josh Keller played trumpet with the band from 2002-06 while a student at the U. of Maryland, and rejoined for 2007-8. An alumnus of the Montgomery County Honors Jazz Ensemble and recipient of the "President's Scholarship," Josh majored in Music Education. He also played with the SingCo Rhythm Orchestra and the New Orleans-style brass band Yamomanem. After graduation, Josh served as an AmeriCorps volunteer in New Orleans, participating in Hurricane Katrina recovery efforts. Josh then served as a substitute music teacher in Maryland schools before moving to Michigan to work as a director at a camp facility. In Michigan he plays in a band called Who Hit John?, which combines folk and early jazz, and has also gigged with the Superior Jazz Band. John Kocur played clarinet, alto and soprano sax, banjo and guitar with the band in 2007-8 while a graduate student at Howard U. He holds a degree in Music Education from George Mason U. and a Masters in Jazz Studies from Howard U. John performed in Japan with the Howard U. Jazz Ensemble, and has also performed with the Smithsonian Jazz Masterworks Orchestra, Thad Wilson Jazz Orchestra, Metropolitan Jazz Orchestra, American Festival Pops Orchestra, and McLean Jazz Orchestra, and leads his own quartet. John has taught jazz history and theory at George Mason U. and Northern Virginia Community College. He was selected for the Kennedy Center's prestigious Jazz Ahead program, and was an Artist-in-Residence at Strathmore. John is also a founder of the Loudoun Jazz Society. Mike Kramer played banjo and guitar with the band in 2008-9 while a student at the U. of Maryland. Mike is a winner of the Jonathan T. Deutsch Award for young jazz composers. He has also played with the New Orleans-style brass band Yamomanem. Mike went on to graduate with a degree in jazz studies, and is now in the Army Blues, one of the nation's top military jazz ensembles, where he also plays in their trad jazz ensemble Swamp Romp. Dave Lambert played trombone with the band in 1992-94 while a student at James Madison HS. Dave was twice a finalist in the East Coast Jazz Festival's Fish Middleton Scholarship competition. Dave graduated from James Madison U. with a degree in Music Education, and went on to do graduate studies at Western Michigan U., where he won a national Down Beat Award for "college outstanding performance". Now with a doctorate in music from the U. of Miami, Dave taught at the U. of Georgia and went on to become Director of Jazz Studies at U. of Mary in ND. Kevin Lambert, a graduate of the U. of Maryland, played tuba in the band in 2008-12. Kevin is a recipient of the Semper Fidelis Award for Musical Excellence, and was a National Merit Scholar. Paul Lambert played trombone with the band in 2008-12 while a student at the U. of Maryland. He was named to the All-State Band and All-State Jazz Ensemble, and was a semifinalist in the Army's Classical Solo Competition. Paul is a recipient of the Louis Armstrong Jazz Award, and was a National Merit Scholar. Jared Lampshire played clarinet and tenor sax with the band in 2015-16 while a student at Sherwood HS, and rejoined for summer '17 while a student at Temple U. Jared was named to the All-County Band, and also played in the Jazz Academy Orchestra. Jared plans to be a professional performer/educator. Steve Leas played banjo and guitar with the band in 2012-17 while a student at the U. of Maryland. He won the Maestro Award at the Boston Heritage Festival. Steve majored in jazz performance and Spanish, and teaches guitar. He has gigged with the Happy Pals New Orleans-style jazz band in Toronto. Stephanie Lee played clarinet with the band in 1996 while a student at James Madison U. She won the National Association of Music Merchandisers Scholarship, and has worked for the Musicians Union. She subsequently relocated to Florida. Seth Lieberman played clarinet and alto sax with the band in 2004-2005 while a student at the U. of Maryland. Seth majored in clarinet performance under a music scholarship. Previously, he won a clarinet performance scholarship from Skidmore College. Seth went on to teach music in Brooklyn. Kevin Marshall played drums with the band in 1989 while a student at Fairmont Heights HS. Andy Mason played clarinet, and tenor, alto and soprano saxophones, with the band in 1994-95. Andy studied music composition at Virginia Commonwealth U. He later played in the Tom Cunningham Jazz Orchestra. Tom Mason played piano with the band in 2008-12 while a student at Lake Braddock HS and Northern Virginia Community College. He also played in the Blues Alley Youth Orchestra. Tom also plays guitar and harmonica. Rachel McCarthy (now Rachel Erickson) played piano with the band in 1989-92 while a student at Langley HS and George Mason U., and rejoined for 1996-98. Rachel was selected for a spot in the band at Kings Dominion theme park. She later became a member of the board of directors of the Potomac River Jazz Club, then served as its President in 1995-6. Rachel is a Certified Public Accountant, and held the piano chair with Doc Scantlin and his Imperial Palms Orchestra for several years. She is married to CFJB alumnus Dave Erickson. Dave Miller played drums with the band in 1991. Dave graduated from Earlham College. Jim Misa played trombone with the band in 1989-91 while a student at American U., majoring in Music Composition. Jim went on to teach music at a local school, and then continued his teaching in Colorado. Jim first met his wife on a CFJB band trip. Ron Mitchell played banjo and guitar with the band from 1992-97. Ron studied at the Guitar Institute of Technology. Ron also performed with the LaSalle Dance Orchestra, New Columbia Swing Orchestra and the Sunshine Skiffle Band. Mike Mosley played trombone with the band in 1996. Mike was chosen from area-wide auditions to perform in a major jazz concert at Lisner Auditorium. He went on to play in the 296th USARJ Army Dixie Band in Japan. Mark Mossey played trumpet and piano with the band in 1995-96 while a student at George Mason U. Mark later organized traditional jazz gigs in Charlottesville, VA while studying medicine at the U. of Virginia. Other CFJB alumni frequently showed up on Mark's gigs. He went on to play with the Hot Jazz Seven in Ohio. Mark is now a Doctor of Medicine and lives in Maryland. Matt Musselman played trombone in the band in 2001-2004 while a student at Walt Whitman High School and Montgomery College. Matt was named to the All-County and All-State Jazz Ensembles. He also performed with King James and the Serfs of Swing, the SingCo Rhythm Orchestra, the Tom Cunningham Orchestra, and the Celestial Sliphorns. A recipient of the Hank Levey Outstanding Soloist Award and a Chantilly Jazz Festival All-Star award, Matt wrote arrangements for the Air Force's jazz ensemble, the Airmen of Note. Matt went on to tour with the Glenn Miller Orchestra and has performed in New York with Vince Giordano's Nighthawks, the Baby Soda Jazz Band, the Grand Street Stompers, the Glenn Crytzer Big Band, and the Hot Jazz Jumpers. He currently leads his own traditional jazz band in New York, Grandpa Musselman and the Syncopators, which was selected for the prestigious Jazz Aspen Snowmass Academy program and has headlined at Dizzy's Club at Jazz at Lincoln Center. Matt graduated from the Manhattan School of Music and then earned a Master's at the Juilliard School of Music. He has worked at the Louis Armstrong House and Museum. Dwayne Nitz played drums with the band in 1996-97. Dwayne is also an actor, and has appeared off-Broadway and in films. Paul Olenick played trombone with the band in 1991-93 while a student at Seneca Valley HS. Paul was a winner of the national Clifford Brown/Stan Getz Fellowship awarded by the International Association for Jazz Education, and was also a winner of the East Coast Jazz Festival's Fish Middleton Scholarship, as well as receiving a Thad Jones Memorial Scholarship and a National ARTS Scholarship. Paul went on to study jazz at the U. of North Texas. He is now a freelance musician in New York City, performing on trombone and guitar with the Tommy Dorsey Orchestra, the Billy May Orchestra and many others. Paul has toured extensively in North America and Europe, and has performed for broadway shows and films. Gabe Osborne played trombone with the band in 2004-2005 while a student at Montgomery Blair HS. He was named to the All-County Jazz Ensemble and the Blues Alley Youth Orchestra. Gabe went on to graduate from the U. of Tennessee, where he majored in Jazz Studies. Since then his work has included engagements with the Glenn Miller Orchestra. Jack Ozment played piano with the band in 2009 while a student at the Duke Ellington School of the Arts. Jack was a winner three times in the DC Public Schools Piano Competition, and has played in venues in Barbados and the Bahamas. He went on to pursue jazz studies at Temple U.
Kevin Palacky played banjo and guitar with the band in 1991. Kevin studied jazz at Capital U. and the Eastman School of Music, and graduated from Virginia Commonwealth U. He performed in show bands at Walt Disney World, and went on to play in the Florida-based swing band Swingerhead, which toured nationally. Nate Panning played drums with the band in 2000-01. Nate studied at Virginia Polytechnic U. He was a winner of the Woody Herman Jazz Award. Nate went on to teach at Seton Junior-Senior High School. He has played in the SingCo Rhythm Orchestra and the Mark Brandt Trio. John Paul played piano with the band from 2002-2005 while a student at American U. John previously studied at New School U. in New York, and went on to continue his studies in Paris. John's own jazz group Sanga Equation, featuring CFJB vocalist Lena Seikaly, toured in France. John also played in the Blues Alley Youth Orchestra. Chris Pincock played trombone with the band in 1995 while a student at Wootton HS, and rejoined for 1997. Chris went on to study composition at the U. of North Texas, New England Conservatory of Music, and Manhattan School of Music. Now based in Seattle with a master's in music, he has performed with Bob Brookmeyer, Bobby Shew, Toshiko Akiyoshi, Gunther Schuller, David Liebman, and Slide Hampton, and has taught jazz at the U. of New Mexico, Long Island Conservatory, and public schools. He currently divides his time between composing, performing and teaching. Alex Poetzschke played clarinet and alto sax in the band from 2006-2007 while a student at Quince Orchard HS, and rejoined for 2012-13. He was named to the All-State Jazz Ensemble, and twice to the All-County Jazz Ensemble. Alex also played in the Jazz Academy of Music All-Stars. He holds a degree in music from the U. of North Carolina. Liz Prince played tuba in the band from 2003-8 while studying tuba performance and music history at the U. of Maryland. Liz formerly played in a trad jazz combo at Roosevelt High School. Liz went on to play trad jazz gigs in New York City, Baltimore, and DC with bands such as Grandpa Musselman and the Syncopators, Dix Out, and Sac Au Lait. Pete Reardon-Anderson, while a student at Walt Whitman High School, played clarinet and tenor sax in the band from 2001-3, and rejoined for 2005. He was named to the All-County and All-State Jazz Ensembles, was nominated for the All-Eastern Jazz Ensemble, and was a finalist in the East Coast Jazz Festival's Fish Middleton Scholarship competition. He won a Down Beat Student Music Award for High School Outstanding Jazz Soloist. Pete was selected to study with top artists at the Dave Brubeck Summer Jazz Colony, and was a winner of the national Clifford Brown/Stan Getz Fellowship awarded by the International Association for Jazz Education. Pete went on to study at the Juilliard School of Music, and was selected for the Kennedy Center's prestigious Jazz Ahead program. He now freelances and headlines in New York City, including gigs with the Baby Soda Jazz Band, the EarRegulars, Dan Levinson, Stan Rubin, Wycliffe Gordon, Paquito D'Rivera, Vince Giordano's Nighthawks, the Lincoln Center Jazz Orchestra, the Village Vanguard Orchestra, and the Jimmy Heath Big Band. Pete has performed at Blues Alley, the Montreal Jazz Festival, the New Orleans Jazz Festival, the Oklahoma Jazz Hall of Fame, the Bix Beiderbecke Memorial Jazz Festival, the New York Hot Jazz Festival, and such New York venues as Carnegie Hall, Village Vanguard, Jazz at Lincoln Center and the Blue Note. He performed in Brazil with Bob Wilber's All Stars, and can be heard playing early jazz on the Grammy-winning Boardwalk Empire soundtrack CD. Pete and his brother Will tour together with their own group all over the U.S. and Japan, playing traditional jazz and later styles, and have produced their own CDs. Will Reardon-Anderson, while a student at Walt Whitman High School, played clarinet and alto sax in the band from 2001-3, and rejoined for 2005. He was named to the All-County and All-State Jazz Ensembles, was nominated for the All-Eastern Jazz Ensemble, and was a second-place winner in the East Coast Jazz Festival's Fish Middleton Scholarship competition. Will was selected to study with top artists at the Dave Brubeck Summer Jazz Colony, and won a Down Beat Student Music Award for High School Outstanding Jazz Soloist. Will went on to study at the Juilliard School of Music, and was selected for the Kennedy Center's prestigious Jazz Ahead program. He now freelances and headlines in New York City, including gigs with the Baby Soda Jazz Band, Vince Giordano's Nighthawks, Dan Levinson, Stan Rubin, David Ostwald's Louis Armstrong Centennial Band, Wycliffe Gordon, Paquito D'Rivera, the Lincoln Center Jazz Orchestra, the Village Vanguard Orchestra, and the Jimmy Heath Big Band. Will has performed at Blues Alley, the Montreal Jazz Festival, the New Orleans Jazz Festival, the Oklahoma Jazz Hall of Fame, the Bix Beiderbecke Memorial Jazz Festival, the New York Hot Jazz Festival, and such New York venues as Carnegie Hall, Village Vanguard, Jazz at Lincoln Center and the Blue Note. He performed in Brazil with Bob Wilber's All Stars, and can be heard playing early jazz on the Grammy-winning Boardwalk Empire soundtrack CD. Will and his brother Pete tour together with their own group all over the U.S. and Japan, playing traditional jazz and later styles, and have produced their own CDs. Chris Riegger played clarinet, and alto, tenor and soprano sax, with the band in 1997-98 while a student at George Mason U. Chris also performed with Doc Scantlin and his Imperial Palms Orchestra and the New Columbia Swing Orchestra. He went on to study jazz at the U. of North Texas. Jesse Rodefer played drums with the band in 1992-93. Jesse studied at Berklee School of Music. He later played with the New Columbia Swing Orchestra. Jay Rosenthal played drums and vibes with the band in 1998 while a student at Richard Montgomery HS. He won a jazz improvisation award at the Montgomery County school jazz festival. Jay went on to attend the U. of Maryland, and now teaches percussion. Lena Seikaly was vocalist with the band from 2003-8, doubling on clarinet and piano, while a student at McLean HS and then the U. of Maryland. Lena is an accomplished singer of both jazz and opera. She was a semi-finalist in the prestigious international Thelonious Monk Jazz Vocal Competition. During her student years, she was named to all-district and all-state choirs, was a finalist for the Washington Post's Music and Dance Scholarship, and won awards for acting and art. Lena has been the featured artist at Sacramento Traditional Jazz Society concerts, and toured France with Sanga Equation, a jazz band led by former CFJB pianist John Paul. She was selected for a private session with renowned mezzo-soprano Marilyn Horne, and also won the Eleanor Searle Whitney McCollum Voice Award and the Roberta Peters Voice Award awarded by the National Society of Arts and Letters, placing fifth in national competition. Lena was selected for the Kennedy Center's prestigious Jazz Ahead program, and was an Artist-in-Residence at Strathmore. She has served on the jazz faculty of the Duke Ellington School of the Arts. In addition to leading her own jazz trio, Lena is a member of Dave Robinson's Conservatory Classic Jazz Band, and has also sung with the Kalahari Jazz Band and the LaSalle Dance Orchestra, as well as the Smithsonian Jazz Masterworks Orchestra and the Army Blues. Mike Shade played banjo and guitar with the band from 2001-06 while a student at Herndon High School and George Mason U. He was a recipient of the Louis Armstrong Jazz Award, and he received an Outstanding Soloist award at the Nashville Band Competition. Mike was also named the Northern Virginia winner and East Coast runner-up in the Guitar Center's "Guitarmageddon" competition. Halley Shoenberg played clarinet and alto sax with the band in 1997-98. Halley studied at Indiana U. and Florida State U. In 1998 she toured Germany with the Washington Symphony Orchestra. Halley has performed with local big bands including the New Columbia Swing Orchestra, LaSalle Dance Orchestra, Craig Gildner Big Band, and Tom Cunningham Orchestra. She currently plays with the Blue Sky Five, and leads her own Hot Gumbo Swingtet as well as her own modern quartet. Marc Sorel played piano with the band in 2000 while a student at Walt Whitman HS. Marc was named to the All-County Jazz Ensemble, and won a Best Soloist Award at Maryland's scholastic jazz festival. Marc went on to graduate from Yale U., and plays freelance gigs in the D.C. area. Zach Stamler played clarinet and tenor sax with the band in 1999-2000 while a student at Bethesda-Chevy Chase HS. He was named to the All-County Jazz Ensemble. Zach went on to attend Ithaca College where he majored in jazz studies. Kirsten Thien was vocalist with the band in 1993-94 while a student at Georgetown U. Kirsten now tours and records with her own group in New York City. Pat Tiglao played drums with the band in 1993-95 while a student at Washington-Lee HS. Alvin Trask played trumpet with the band in 1991 while a student at Howard U. Alvin now directs the Montgomery College Jazz Ensemble, and has performed with the Craig Gildner Big Band. Andrew Velez played trumpet with the band in 2009-16 while a student at George Mason U. He majored in music composition, and went on to pursue a Master's in secondary education. Andrew toured China with the GMU Jazz Ensemble, and was twice selected to attend Banff International Music Camp under scholarship. The recipient of GMU's Green Machine Musicianship Award, Andrew teaches trumpet at Catoctin School of Music, in addition to directing a youth choir and leading his own jazz quintet. John Voigt played drums with the band from 2005-8 while a student at Walt Whitman HS. He went on to attend Evergreen State College in Washington state, with aspirations to be a professional musician and film director. Rob Voigt played clarinet and alto sax in the band in 2003-4 while a student at Walt Whitman HS. Rob also played with the Walter Salb Big Band. He went on to attend Vassar College, double-majoring in physics and music. William Wadsworth played drums with the band in 2012-17 while a student at the U. of Maryland. William received the Outstanding Senior in Jazz award. He designed the CFJB web site. Will Ward played banjo and guitar with the band in 2000-1 while a student at Walt Whitman HS. He was named to the All-County Jazz Ensemble, and also played in the Washington Conservatory Big Band. Will went on to attend the U. of Pennsylvania. Derek Waters played tuba with the band in 1991 while a student at Howard U.
Tyler Waters played drums with the band in 2012-13 while a student at George Mason High School. Tyler also played in the jazz group Guava, as well as the Levine Virginia Big Band. He was named to the All-State Jazz Ensemble. Tyler also plays vibes, and is now studying jazz performance and composition in college. Phil Weitzman played banjo and guitar with the band in 1998-99 while a student at Sidwell Friends School. He was a winner of the National Guitar Summer Workshop Jazz Competition. Phil went on to attend the Manhattan School of Music. Dave White played trumpet with the band in 1992-94. A graduate of West Virginia U., Dave went on to play in the First Corps Army Dixieland Jazz Band in Washington state, and studied to be a music educator. Lee Williams played clarinet and alto sax with the band in 1992-94 while a student at Suitland HS. Juna Winston played trombone with the band from 2006-8 while a student at the U. of Maryland, where he completed his major in trombone performance. He played in many campus bands, and was selected for one of the bands at Busch Gardens. He also performed with the SingCo Rhythm Orchestra. Juna played jazz in Austria for several years before returning to the U.S.
Mike Wittman played trombone with the band from 1999 to 2003. Mike graduated from the U. of Virginia. Adam Yarian played piano with the band from 1999-2004 while a student at Thomas Pullen Middle School and Roosevelt HS. After winning the World Champion Old Time Piano Player Contest--Junior Division in Illinois three times, he went on to win the Senior Division three successive years, starting at the age of 18, and became a Retired Champion. Adam then became a featured performer at national ragtime festivals. After earning a degree in classical and jazz performance from the U. of Southern California, Adam went on to earn a law degree at the U. of Chicago, and now practices law in Los Angeles. Adam Yost played trumpet with the band in 2000 while majoring in music performance at George Mason U. Adam went on to attend James Madison U.